It’s not just the so-called mad corroding the sane, of course. Everyone in the novel is corroded by the reality of Argentinian history—what is the delusional narcissist, who believes himself legitimate master of the universe, but a conquistador? Is the distraught philosophy student out of his mind, or simply heartbroken by bearing witness to the poverty lying at the outskirts of his town? They are corroded, too, by the experience of exile—that expanse of desert and the institution to which these five people, turned away by their towns and families, have been sentenced. Juan José Saer, an Argentinian born to Syrian immigrants and self-exiled in France much of his life, writes novels obsessed with time, place, memory, and history, never supposing their fixity. Most of his work takes place in the same apocryphal Zona near Santa Fé, and many characters (including Garay and M. Soldi) recur. And yet, book to book, characters and stories complicate and confuse as much as they inform one another. 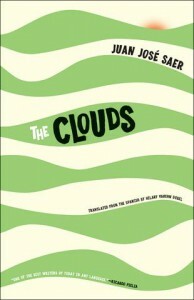 As an addition to the translated Saer canon, The Clouds is significant. As an introduction to that canon, it is delightful. To insist upon reading his novels “in order” would be to impose an outside order upon them. 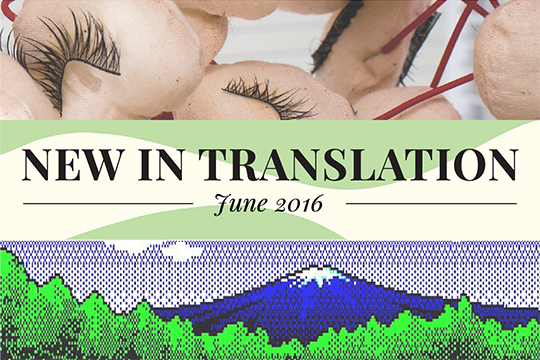 Hilary Vaughn Dobel is a fine match for Saer’s criss-crossing, back-stepping prose. The English she crafts has a foreign feel. This is not to say she preens sentences into the plumes of an exotic bird. Instead, she guides the language gradually from grounded and precise to something more detached, rambling, and uncertain. By the book’s end, Dr. Real observes that “in the plain’s monotony we had lost the instinct or notion that separates the inner from the outer, as if the language provided in this world had also been uprooted from us and would have spoken itself, doing without the thought and will with which we had learned to employ it on first entering the world.” If one thing is clear in the logic of The Clouds, it is that madness and reality—just like past and present—are one another’s progenitors. 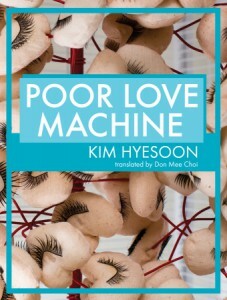 “Enter the inside of the sunny morning, and it seems as if the scream can always be heard.” So begins Kim Hyesoon’s Poor Love Machine, which, through its layering of grotesque and mundane imagery, constantly disrupts surfaces and their relationship to concealment, hygiene, spectacle. its arms folded when I unfolded mine…I looked at it as if I were a live mirror….My body dripped down outside my clothes. I buried the bowl between my knees and wept. The bowl became more slippery. It looked like someone else’s face. Then your face slipped out from it and your eyes evaporated, and, in my hands, your skull crumbled into powder and melted away like dough. Here, as with many of the poems in the book, the grotesque becomes a way to not only disrupt and undermine the patriarchal culture of the dictatorship Kim grew up under—insisting in the importance of minor, dirty, and horrific material—but also to acknowledge the grotesqueness of the world she was living in. As she has said, “I think that solely through a language of poetry that has schizophrenia can women force the father language down from power.” Poor Love Machine is a constant exercise in dismantling this power and also creating a new mother tongue. 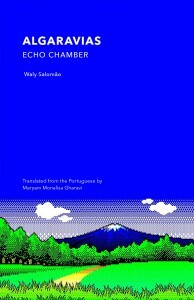 Even though in Salomão’s world “all the full things tear each other to pieces / or are lacerated” (“Guarding the Hollow of Time” 75), “the days follow each other and settled is the intention / to convert all prohibited things and rust / into pieces of paradise. Or vice-versa” (“Open Letter to John Ashbery” 41).